Osteosarcoma’s days are numbered thanks to the canine osteosarcoma vaccine and new immunotherapies like the ELIAS® Cancer Immunotherapy (ECI ®) treatment. Today on Tripawd Talk Radio you’ll learn all about the company’s new Osteosarcoma vaccine that’s helping dogs enjoy longer survival times than ever before — without chemotherapy! When your dog is diagnosed with osteosarcoma, making the chemotherapy decision is tough. But what if you could skip that step altogether, and head straight to a treatment that successfully fights the disease without chemotherapy? Would you do it? Many pet parents said “You bet!” when the University of Missouri Veterinary Health Center Oncology Service announced a new clinical trial for the ELIAS Cancer Immunotherapy (ECI) treatment. When the study ended, researchers reported a 415 day median survival time thanks to this breakthrough vaccine-primed T cell therapy that fights the disease using the dog’s own tumor. Get the Details on Tripawd Talk Radio! 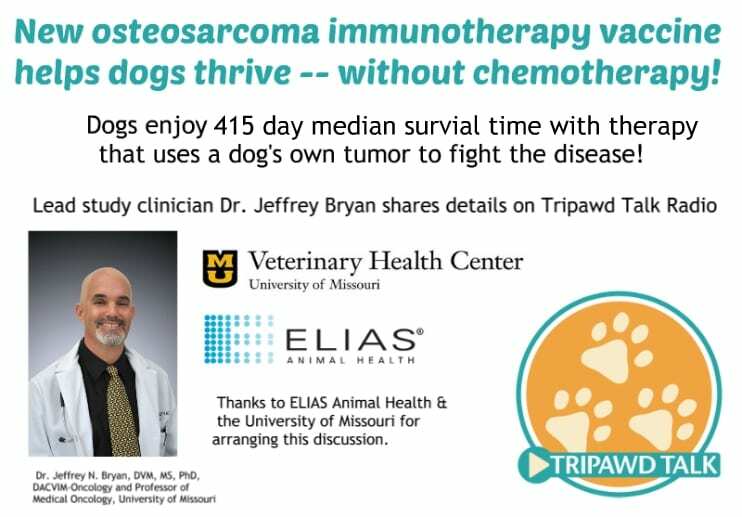 Today on Tripawd Talk Radio, we are happy to share our conversation with the study’s lead clinician, Dr. Jeffrey N. Bryan, DVM, MS, PhD, DACVIM-Oncology and Professor of Medical Oncology at the University of Missouri. Interested in the ELIAS cancer immunotherapy treatment for your dog? Visit the ELIAS “Available Locations” listing to find a participating veterinary oncology clinic near you. Can’t listen now? Read the transcript below. Admin Guy: Hello and thank you for listening. This is Tripawd Talk Radio and today is March 13th, 2019. Osteosarcoma in dogs has always had a rather grim survival rate with few dogs living more than one year after diagnosis. The good news is, that’s changing. Oncologists at the veterinary health center at the University of Missouri College of Veterinary Medicine have recently partnered with ELIAS Animal Health to create an Osteosarcoma vaccine from a dog’s own tumor for that specific dog’s immune system to recognize. The study has proven very promising and we are honored to have a lead clinician Dr. Jeffery Bryan with us here to discuss the results. Dr. Bryan is a professor of medical oncology at Mizzou and a board certified specialist in veterinary oncology. His research focuses on comparative examination of cancers and companion animals to better understand cancers in all species, including humans. If you’re one of the many Tripawds members whose pets were diagnosed with bone cancer, keep listening to learn more about this osteosarcoma immunotherapy study, its progress results and what this all means in the fight against cancer in pets and people. Welcome to the show, Dr. Bryan, thank you for joining us. Rene: Thank you very much. Hi Dr. Bryan. It’s Rene here. I am so excited to get started with this talk. Thanks for being here. Dr. Bryan: I’m excited to be here, Rene. Thank you. Rene: So, I’ve been reading the headlines about the work that you’ve been doing at Mizzou, and let’s just jump right in. Can you tell us more about this new canine osteosarcoma vaccine that you’ve been working on? And just give us a little backstory about what the basis of it is and then tell us more details about your particular study. Dr. Bryan: Well, it’s an exciting product of a team effort between the University of Missouri and ELIAS Animal Health. Doctor Gary Wood, one of the chief scientists at ELIAS brought this technology to us and they were interested in us helping them do a clinical trial to understand whether their immunotherapy approach would work. And it’s called the vaccine, but vaccine is really only part of it. So these dogs who have bone tumors typically will undergo amputation. They all did in this trial. They underwent amputation and had the tumor cells removed from the tumor after the leg was removed from the dog. And those tumor cells were used to create vaccines against the dog’s own tumor. So each dog received three vaccines against their own tumor. And then following that, their immune cells that were generated by those vaccination events were collected from their blood using an apheresis machine, a lot like a person donating platelets is put on an apheresis machine. Dr. Bryan: We can also collect the new mononuclear cells, which contain lymphocytes in that fraction of blood. And then those lymphocytes are sent to Kansas City back to ELIAS for expansion and activation so that they became very angry at whatever their target was supposed to be to create an infusion, like a blood transfusion, basically of immune cells to give back to the dog from which they were taken. And the goal then is for these lymphocytes that are activated to search the body for any cell expressing these abnormal proteins associated with the cancer and eliminate those cells. And thereby, ideally eliminating metastatic lesions wherever they might hide within the dogs after they had their primary tumor removed. Rene: I love this. I’m picturing this angry little army of of cells marching around my dog’s body and looking for, you know, just some action to destroy that cancer. So this is great. I love this. Dr. Bryan: That’s exactly what you should picture. And the other neat piece of it is if it works the way it’s supposed to, it should also leave memory cells behind so that if these proteins ever show up again, theoretically the immune system could react to them a second time and eliminate that recurrence as well. And there’s even some possible evidence of that in this trial that I can tell you about. Rene: Oh yeah, I definitely want to hear about that because I was going to ask you a related question. So you started the trial how long ago? Rene: That’s not that long ago then, this is actually moving pretty quickly. I mean, from what I understand, these things usually take a really long time. So, wow. Three years is short. Dr. Bryan: Yeah. And the dogs have done very well. There are a total of 14 dogs that have gone through the trial. Ten of them received the entire course of therapy, four did not for various reasons, including two of them having early failures. One of them having a reaction before we learned how to give the proper pre-medications to stop the reaction to the T-cell infusion. And then one was on trial when the first dog’s reaction occurred and we just stopped the trial temporarily and took that dog off trial as well. So those two went off trial, technically, although the dog that got the T-cell infusion did not Interleukin-2, that dog did live a very long time well over a year following its T-cell infusion before it developed metastatic disease, and then she ultimately succumbed to her disease, but after a very long time. The rest of the dogs, ten of them that received the entire planed protocol, including the Interleukin-2 injections, five of them are still alive and all five that are still alive are past 415 days. Dr. Bryan: It’s really remarkable to have that big a proportion do that. Well, we’re very excited about that. Among those five is one dog that developed a documented metastatic lesion on his skin. We performed cytology and the cytology results were entirely consistent with an Osteosarcoma lesion on the skin. And so he was taken off trial at the time, went home to presumably progress and likely die of his disease over a period of time. And so we followed up with him quite a few months later to find out how things had gone and how long he had lasted after that metastatic lesion was identified, and found out that the metastatic lesion had disappeared! And he came back, he had a whole body pet scan just like they would do for a person looking for the disease hiding in the body and found it nowhere at all. So he remains alive and happy and disease free after having developed a metastatic lesion, which is really unusual and nearly unheard of with the chemotherapy response. Rene: That is amazing. And I believe that dog’s name is Roscoe, correct? Dr. Bryan: Yes. I think he was the one indeed. Rene: Yeah. Soon we’re going to be sharing a little story with uh, Roscoe and his mom. And, I mean that really just made me so happy to see because we’ve had so many members who have been through that. The cancer comes back usually in the lungs but like, you know, sometimes somewhere else and they don’t last very long after that. So I mean what you are doing is just going to change lives and we cannot thank you enough. Dr. Bryan: Well I have to thank ELIAS Animal Health because this really is their invention and we are very excited to have been able to help them design and execute the clinical trial that tested it and they are offering this on a commercial basis now for families that wanted to get this kind of therapy for their dogs. Rene: That is one thing I wanted to talk to you about. So offering it where, just in the US? Is it also being offered overseas? Dr. Bryan: Currently it’s just in the U.S. and the limitation of this trial is it requires a very specialized piece of equipment to perform the apheresis to collect the lymphocytes. So there are a number of sites around the country that have apheresis centers that are contracted with a ELIAS Animal Health. So you can check with their website and see a list of those resources that are available. And then you have to have a veterinarian that can help you with the amputation and cell collection for the vaccine preparation that ELIAS would perform. A veterinarian that can help you give the vaccines and then a veterinarian willing to infuse the T-cell infusion after it’s been collected at an apheresis center. So much of this can be done at sites that aren’t necessarily the main apheresis center. For example, there is a specialty hospital in St Louis that is prepared to administer this and then they send the patients to us at the University of Missouri for the apheresis. So if this is something that people are excited about, they can contact ELIAS and understand the practicalities of that. Dr. Bryan: That is a great question and a difficult to answer question. Immunotherapies in general have struggled against large solid tumors and by large I mean really anything much over a centimeter in diameter. So not really huge by any means. I think that immunotherapies are likely to do best against microscopic things as more comfort is generated with this technology and more evidence supports its effectiveness. The possibility of doing a limb sparing surgery where you just remove the segment of bone that was affected could become more and more realistically practical. And so the dog could potentially keep its leg but lose that piece of bone and have it replaced with something else. That’s a possibility as well. But as things stand now, getting that tumor off of there to create the vaccine is a really critical step. And until we have a good replacement for that step, it’s going to require surgery. Rene: So a little bit of a good news and bad news. I mean the bad news is amputation is still going to be required, but the good news is that people would be able to bypass chemotherapy for this treatment. Nobody wants to do chemotherapy, but did you find it hard to recruit people who wanted to skip that step altogether? Dr. Bryan: I was surprised how easily the trial enrolled actually. It was slow starting, but then it enrolled pretty continuously. We had another pair of clinical trials happening simultaneously that were sponsored by Morris Animal Foundation and the National Cancer Institute with amputation and chemotherapy available in that trial. So families had a choice between a purely immunotherapy trial versus a purely chemotherapy trial. And many of the families chose the immunotherapy trial. In fact, we had a number of people seek us out specifically because they wanted to avoid chemotherapy if they could. I was very concerned before we started the trial that having no chemotherapy in this could be potentially even an ethical criticism because chemotherapy is expected to be necessary to have long survival in most cases of dogs with Osteosarcoma. And so it was a very pleasant surprise to not see dogs failing early and for these dogs to have survived as long as they have on average. It’s been quite remarkable. Rene: Yeah, I mean we are over the moon about this is. It’s something that I know I would have pursued with my own dog when he had Osteosarcoma because we opted out of chemo for various reasons and if this was available, oh my gosh. I really, really hope that our members will look into this treatment where, where they live in the U.S. So that they can see if it’s an option if their dog has been diagnosed. Do you see it at some point possibly being offered for cats? Dr. Bryan: That’s a great question. I have not discussed that with the folks at ELIAS, so I’m not sure. There’s no reason the technology couldn’t be applied to cats. The challenges are that apheresis is much more challenging in cats because of how small they are, it would be like performing apheresis on an infant essentially. So there are some challenges there. Also the processes for activating lymphocytes in cats are not as well defined as they have been in dogs, and the company I don’t think has experienced with those specifically. So that would be something they would have to investigate first. Rene: Okay. Well that’s good to know because I mean it is relatively rare in cats, but we’ve had our share of members and we just had somebody join this week who, whose cat was diagnosed. So I’m sure they’d be interested in hearing this. Dr. Bryan: Yeah. Fortunately cats tend to do better with amputation alone than dogs do. And so hopefully that cat who just joined is going to be a long survivor. Rene: Oh, we sure hope so. And now we hope that we have way more dogs who are long term survivors too because 415 days is amazing. Dr. Bryan, is there anything else that you wanted to add about this is that our community should know about? Dr. Bryan: This is another form of immunotherapy in the spectrum of the new immunotherapies that are coming onto the market. And it’s exciting to think about harnessing the immune system to control these metastatic cancers. So I think that this is a really exciting advancement. I’m excited to see a company that is committed to making a technology designed for dogs. This is not simply a stepping stone to people, although the technology could be transferred to people and they have a human health care company that’s focused on that. I’m just grateful that ELIAS Animal Health is interested in making this a priority for the folks who have dogs here in the United States. And hopefully this is, is a technology that spreads and is available to as many people as possible. Rene: Oh my gosh, we are too. ELIAS, thank you so much for doing this. That is an important distinction that you just said there, Dr. Bryan, about how they’re doing this just for dogs because everything we’ve been hearing about has been a stepping stone for people. So for a company to focus just on animals for this, I mean that says so much about them. We are so grateful. Admin Guy: Yes Doctor Bryan. Thank you so much for your time. We look forward to following the progress of this new treatment and sharing results with the Tripawds community. Listeners can learn more about the work you’re doing at cvm.missouri.edu and get info about this new vaccine at ELIASanimalhealth.com. Find many more pet cancer and amputation resources at tripawds.com. Listen to Tripawd Talk for more fascinating discussions about life on three legs! Subscribe to Tripawd Talk wherever you enjoy podcasts! My girl Sabrina (12 year old Rottie) was excepted in the trial program, we researched the program and it looked amazing. She had osteosarcoma on here rear leg. We signed up and schedule the amputation of her leg, very hard decision. The plan was to removed the leg and have the cell harvested then Elias would make the vacations and sent them back to my amazing vet IVO Phoenix. This was done and they contacted us to have the first one administered. We were very excited and later that day they again contacted us and said Elias contacted them and said that they did not have enough cells to create the 3 require vaccines. So we were no longer a part of the trial we were heart broken. The only reason we agreed to move forward with the amputation was to possibly extend her life by being in the program. My vet Dr Hershey being the amazing person she is was heart broken as well and offer the Chemo at no cost. There is nothing for sure in life I understand, my only comment regarding this is maybe they can improve the collection process in the future so that others will have the opportunity and success in their program. Alias program is so amazing and it provides owners to have their loved ones around longer, priceless! Great work keep advance technology!! Patrick, thank you for sharing your experience with us, it’s so important for others to know about every possible angle of participation in a clinical trial. I’m sorry things didn’t work out. Your vet is truly an angel on earth for helping your girl fight cancer.